Endless Summer House i Tenerife, Spanien: Reservér nu! 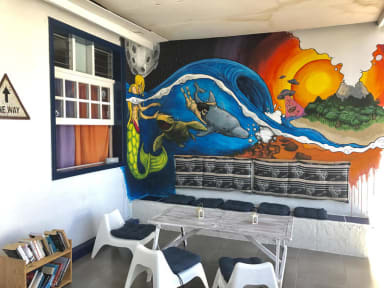 We are a Surf Hostel located in Playa de las Américas. We offer you a nice and friendly place to enjoy your holidays with great facilities. Every friday we organize a bbq to all our guests. The rooms with bunk beds are perfect if you want to meet other people, it has a wardrobe and fan. There are shared bathroom facilities with a hairdryer, as well as a shared lounge. In the terrace we offer barbecue facilities, microwave and kettle. Bike hire and an airport shuttle service can be organised for you. Endless summer House is located 17 km from the Tenerife South Airport and 400m from the best beaches in Playa de las Américas. In the same street you can find the best water park in all the world: Siam Park. Only 5 minuts walking from our hostel you can find Siam Mall, the new shopping center in Tenerife South. In the same street you will find supermarkets and restaurants, and only 5 minutes walking, the bus station and taxi stop. Late check in Policy : If you will arrive later than 23.00pm you need to contact us and we will wait for you. If you will arrive later than 23.30 pm we will charge 7 euros per hour waiting.